Whenever the LoToJa Classic’s men’s or women’s course record gets broken, it’s usually by only a few minutes or less. But Spencer Johnson blew that trend away during this year’s race on Sept. 8. The Cat. 2 cyclist won the Men Pro Cat 123 race and set a new men’s record of 8:18:29 on the 202-mile parcours, crushing last year’s record of 8:42:31 set by Kai Applequist of Boise, Idaho. Johnson, 39, who rides for Endurance 360 and hails from Riverton, Utah, lopped off 24 minutes and two seconds from Applequist’s time. 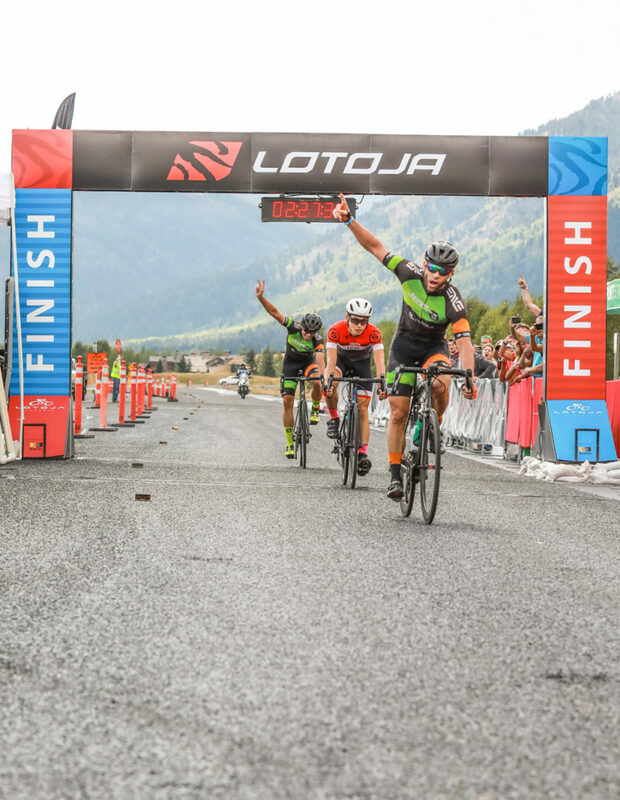 The previous men’s LoToJa course record was set in 2014 by four-time Men Pro Cat 123 winner Cameron Hoffman of Layton, Utah. His winning time that year was 8:45:38. LoToJa is billed as the longest one-day USA Cycling-sanctioned bicycle race in the U.S., with three mountain passes, and nearly 10,000 vertical feet of climbing. 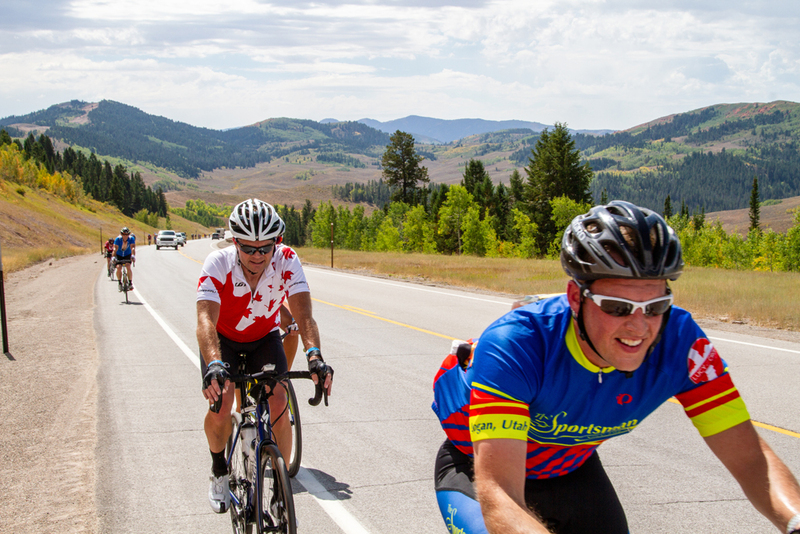 Licensed cyclists ride 202 miles (325km) and cyclosportive riders 205 miles (330km) while passing through northern Utah, southeastern Idaho and western Wyoming. 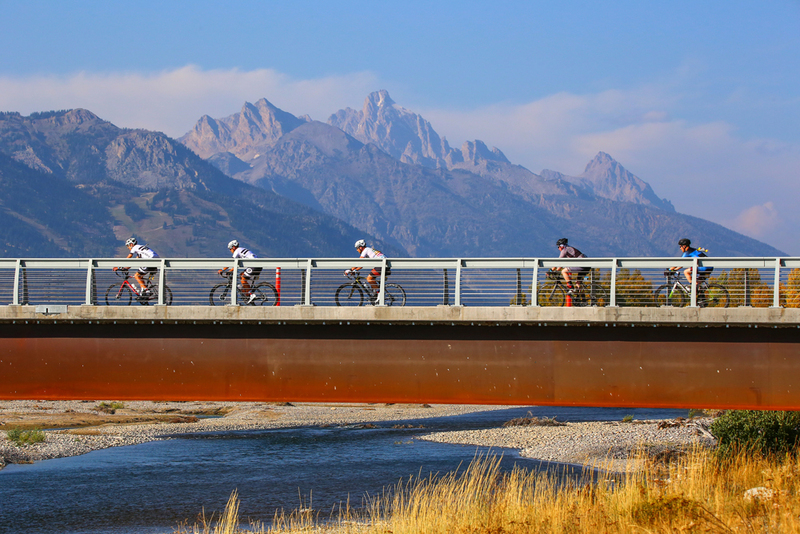 The race begins at Sunrise Cyclery in Logan, Utah, and finishes at Jackson Hole Mountain Resort in Jackson, Wyoming. The race was first held in 1983 with only seven cyclists; nearly 2,000 rode it this year, which was LoToJa’s 36th anniversary. Johnson’s victory and record-breaking ride began only a few miles after the start line when he put himself in a six-man break with his teammate Nathan Manwaring, Morgan, Utah; John Jantz (Team Community Bike), Arlington, Massachusetts; 2013 LoToJa winner Clinton Mortley (Team Livewell), Ogden, Utah; Kent Carlsen (Logan Race Club), Providence, Utah; and Brent Cannon (Team Elevate), Francis, Utah. Both Carlsen and Cannon are Men Master 45 plus riders. The Men Master 45s started with the Men Pro Cat 123s. The break stayed together through Preston (31mi/50km) and across the Bear River. But Mortley, Carlsen and Cannon lost contact during the 22-mile climb to Strawberry/Emigration Canyon’s 7,424 foot-high summit (57mi/92km). Johnson, Jantz and Manwaring went over the summit together and began the descent to Ovid. The trio stayed together through the first support crew feed zone at Montpelier (76mi/122km), on the nine-mile climb to 6,923 foot-high Geneva Summit (84mi/135km), and down the backside of Geneva to the Idaho/Wyoming state line. The cooperation even continued up to LoToJa’s highest summit: 7,630 foot-high Salt River Pass (106mi/171km), which features a 9-percent pitch during the last mile. Jantz did gap Johnson and Manwaring by 30 seconds at the summit to win the King of the Mountain prize. But after setting a time of 14:02, Jantz waited for Johnson and Manwaring and the trio resumed their paceline through Star Valley, pushed by a strong southerly wind. While at the feed zone in Afton, Johnson did the math and figured the three-man break could set a new record. With other teams and riders more than 20 minutes back, the trio could focus on the task and not get slowed by team tactics. Johnson, Jantz and Manwaring kept the pace line working through Alpine Junction (156mi/251km), Hoback Junction (178mi/286km) and onto South Loop Road in south Jackson. But on Village Road with only seven miles to go, the cooperation vanished. Jantz took second place and Manwaring third. All three finished with the same time of 8:18:29. The next rider in for fourth place — nearly 30 minutes later — was Greg Krause (Team Groove Subaru Excel Sports) of Littleton, Colorado, with a time of 8:45:50, followed by Ben Stevenson (Team Endurance 360) of Salt Lake City, Utah, in fifth at 8:50:11. The men’s Pro Cat 123 race had a 19-man field. Johnson attributed his record-breaking ride to the break’s early success outside of Logan and working cooperatively throughout the day. But there was something more. “It came down to three good endurance riders and good weather conditions,” he said. Johnson said he plans to ride LoToJa next year, but he may choose to ride the relay instead. He rode the relay category a few years ago and his team won. He said that experience was a lot of fun. In the Women’s Pro Cat 123 race, Lindsey Stevenson (Team Zone 5) made good on a promise from a year ago. After winning last year’s race, she said she’d return in 2018 and would push for the win. Stevenson, 29, of Salt Lake City, pushed and won for the second year in a row with a time of 9:47:58. Like previous years, the Women’s Pro Cat 123s left Logan at the same time with the Women Cat 4/5, Women Cat 5, and Women Master 35 and 45 open categories. The peloton mostly stayed together for the first 35 miles through Cache Valley until the climb to Strawberry/Emigration Canyon summit began. 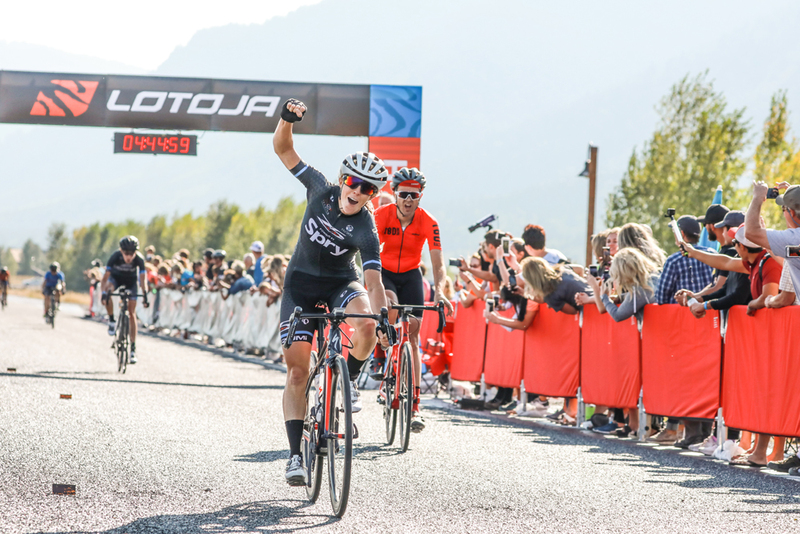 At the top, only five were left: Stevenson, her teammate Eleise Hinton, Pleasant Grove, Utah; 2016 LoToJa winner Marci Kimball (Team Zone 5), Salt Lake City, Utah; Cat. 4 rider Heidi Madsen (Team American First), Layton, Utah; and Master 45 open rider and 2014 LoToJa winner Shirley Leydsman (Team Red Rocks), St. George, Utah. The five-woman break stayed and worked together throughout the day, Stevenson said — except for at Salt River Pass. There, Kimball went to the front and drilled it to the top, taking the Queen of the Mountain prize and smashing the old QOM record of 16:19 by two minutes with a new time of 14:20. The break regrouped on the descent into Star Valley and stayed together through Afton, Alpine and Hoback, Stevenson said. But like most breaks, the cooperation began to dissolve during the final miles to the finish line. At about 1K to go, Hinton jumped and Stevenson followed. She came around Hinton and crossed the line two seconds ahead of her. Hinton finished with a time of 9:48:00, followed by Kimball at 9:48:02, Leydsman at 9:48:02 and Madsen at 9:48:06. Leydsman took fourth place out of the break, but won the Women Master 45 open category and Madsen won the Women Cat 4 category. Stevenson noted that conditions were ideal for the Men Pro Cat 123 riders to smash the old record. But the women started one hour after the men and ran into more variable conditions on course. The current women’s record is 9:35:00, which was set by Melinda MacFarlane in 2013. Stevenson said she looks forward to coming back to LoToJa and pushing for the win — but not next year. At three months pregnant, she and her husband will welcome their first child in June. “I’ll be back, but probably not for a couple of years,” she said. Race Director Brent Chambers said the 36th anniversary LoToJa was a spectacular race and event. He congratulated all riders and support crews who participated this year. He said plans are already underway for next year’s LoToJa, which will be held on Saturday, Sept. 7. • The first LoToJa was held in 1983 and was won by Bob VanSlyke of Logan, Utah, with a time of 9 hours. Six other cyclists started and finished that day. • Race relay course record (new): 2-man team – Bryce and Jeffrey Olsen, Ogden, Utah – 8:45:01. 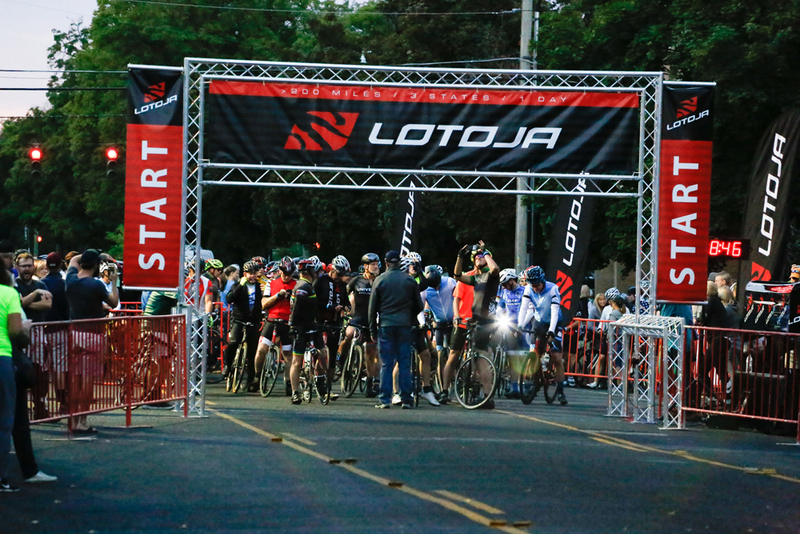 • Since 1983 an estimated 19,000 cyclists have pedaled more than 6 million combined miles to finish LoToJa. • LoToJa involves more than 600 course volunteers; 150 of those are Ham radio operators who provide communications and neutral support. • LoToJa’s fundraising efforts for Huntsman Cancer Foundation exceeds $2 million. • The National Ability Center, Common Ground Outdoor Adventures, Utah High School Cycling League, Bike Utah, and several community organizations/youth groups also benefit from the event.